New Delhi: Google dedicates the doodle for the day to Rachel Louise Carson, an American marine biologist and conservationist. Her book, Silent Spring was noted and credited with advancing the global movement on environment. 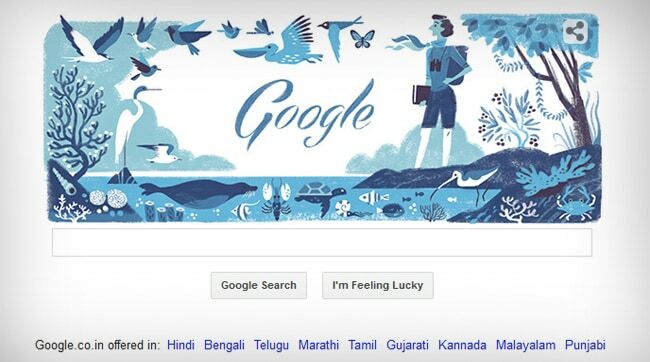 Google celebrates her life, achievements and contributions to marine biology and ecology with the Google doodle showing Rachel Louise Carson with a pair of binoculars around her neck and a notebook in her hand, standing at a water-front surrounded by various species of birds and marine life. The Google doodle marks Rachel Louise Carson's 107th Birthday. Her contributions to environmental studies were greatly appreciated by scholars and scientists. The marine biologists book 'Silent Spring' had a major impact on the environment and social movement in the mid twentieth century. Ms Carson's most significant work was the campaign against the use of DDT (Dichloro Diphenyl Trichloroethane), a common insecticide, in the United States of America. She had questioned the logic of releasing large amounts of chemicals into the environment without a sufficient understanding of their effects on ecology and human health. This eventually led to the ban on agricultural use of DDT in America in 1972. Carson was born to an insurance salesman in Springdale, Pennsylvania. She studied English, before changing her major to Biology. She wrote her first essay, 'The World of Waters' for a brochure at the US fisheries bureau, where she had started her career as an aquatic biologist. The essay however, wasn't published as her supervisor had deemed it 'too good' for that purpose. The Atlantic Monthly, an American magazine, published a revised version of the essay in July 1937. Her book, 'The Sea Around Us' was made into a documentary film. Carson was unhappy about the final version of the script by writer Irwin Allen, but discovered that her right to review the script did not have any control over its content. The documentary went on to win the Oscar for the 'Best Documentary' in 1953. Carson however, was so embittered by the experience of not having any control over her own content, that she never sold film rights to her work ever again. Rachel Louise Carson suffered from liver and breast cancer, and died of a heart attack in April 1964, in her home in Silver Spring, Maryland. Carson was awarded the 'Presidential Medal of Freedom', the highest civilian honour in the United States of America. Her home in Pennsylvania was renamed as 'Rachel Carson Homestead' and became a National Register of Historic Places in 1975. For more Google doodles, please read: NDTV's list of Google doodles) and (The Best Google Doodle's of 2014).